I was sitting in the garden the other evening with a glass of wine having just put our gorgeous sons to bed. The sun was setting over the fields and as I felt the glow of the evening sun warming my face I took a few moments to reflect on just how lucky I am. I love my life. I am a gay man. I’m 34 years old this September. I have an amazing husband in Ivan and I am the proudest father of our 3 wonderful boys; Wil 4, L, 2 and C 1. We live in a beautiful cottage in Hampshire which overlooks fields and woodlands. We share this with our range of animals from dogs to chickens and horses to turtles and numerous others in-between (more about them in another post!). We adore where we live and are always out in the garden with the kids. We also grow our own vegetables, well if I’m honest, Ivan does most of the growing! I really am living my idyllic existence. I have found my pot of gold at the end of the Rainbow. My children. My family. My life. Ten years ago I would never have imagined myself where I am now. I was young(ish), gay, and carefree; living the life that suited me at the time. I could be found most weekends drunk at the local gay bar where I lived at the time in Sussex. I would be at the gym all the time and holiday as and when I wanted. My meals were mostly take out or eat out. If I wanted something I bought it. I worked to fund my carefree life and I loved it – I still look back on it and smile. I imagined that this is how I would always live my life. After all I had the pink pound. The option of kids would never be open to me. My money would always be my own! How wrong! Roll on 10 years. I have no money. Time is not mine, it’s the kids. If I want it I can go whistle. A holiday is a weekend camping up the horse field. Getting drunk is an evening in with my better half and the TV and an early start with the kids and a bleary head. Do you know though, I wouldn’t change it for a second. Yes I would love to have more money to make those stresses easier and yes I would love a weekend just me and Ivan in a nice hotel, with a nice meal and a bottle of wine and more than anything I would love a holiday lying on a beach somewhere getting tanned. But, if it meant giving up anything I have, its not going to happen. Nor would I want it to. After all. Those things don’t matter. What really matters to me now is that the kids are happy and healthy and clothed and fed and exposed to a life that is full of adventure, fun and opportunity. This makes me happy. 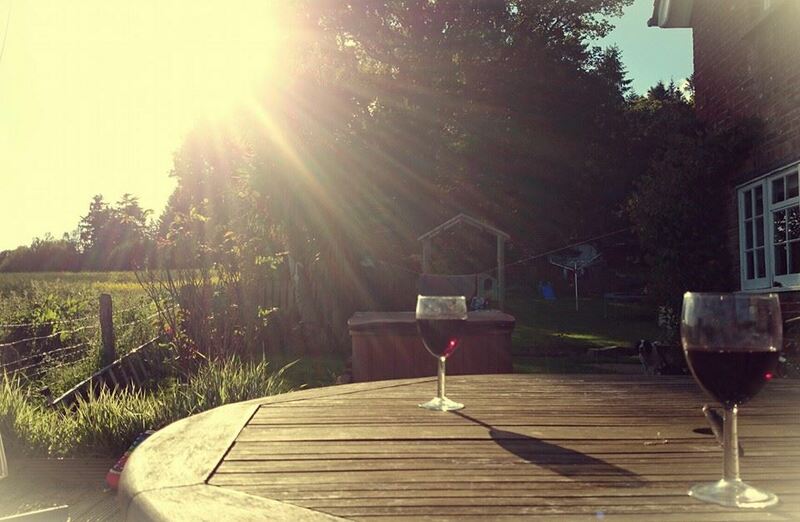 Hey, I can always lay on the decking next to the kids paddling pool with a glass of red can’t I! Wil our eldest was born through surrogacy in 2009 – an amazing gift from my sister and the first child born to a UK surrogate ever. L joined our family through adoption in 2012 and C by the same route in 2014. My god I have so much more to say , so this will have to suffice as an introduction for now. Rest assured that I will be boring you with the wheres and why fors in the days and weeks to come. In the meantime if there’s anything you want to know or any areas you want me to touch on in this blog, please email me at pondersigston@aol.com or comment below. Love that you are keeping a blog, you are truly inspirational. You have achieved so much and have every right to be so immensely proud of yourselves and your young family. It must run in the family with you and your sisters!